For well over two months, the yellow vest movement in France has continued to keep itself illuminated with fervent protests against taxes, the banking system, and the region’s bureaucrats. On Feb. 1, a group of Gilets Jaunes working at the bill printing factory explained their plan to show the world they mean business by burning pallets of bills, starting with Israeli banknotes. The grassroots yellow vest movement in France has consistently made headlines across the world while protesting the country’s monetary system and politics. For instance, on Tuesday, Feb. 5, about 18,000 Gilets Jaunes joined a march in the French capital walking side by side with another 12,000 CGT union workers. The protest also followed a demonstration on Friday, which showed employees claiming to work for the Banque de France banknote mill. The yellow vest associated group threatened to burn large sums of paper banknotes. A news.Bitcoin.com correspondent from France explained how the bill burners are demanding fiscal and social justice in a unique fashion. Starting today we start to burn foreign bills stock — The first paper ream we have here is for Israeli banknotes. We start with this, then we burn everything — If the French government doesn’t change, all foreign countries that are waiting for their bills, will not be delivered. 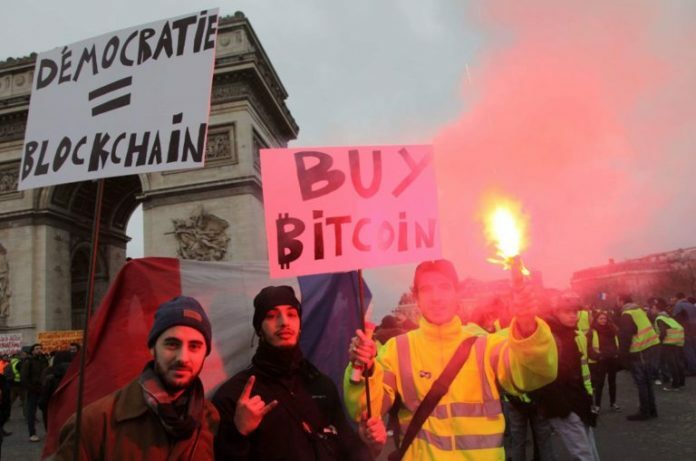 News.Bitcoin.com has covered the yellow vest movement in the past and how many well-known bitcoiners have explained that Gilets Jaunes should really hit the banks where it hurts by moving from fiat to bitcoin. At the same time, the world economy has been shuddering once again and economists are predicting another global depression similar to 2008. Many regions like Venezuela, South Sudan, Turkey, Haiti, Zimbabwe and Argentina are suffering from economic hardships. “If every French person converted 20% of their bank deposits into bitcoin, French banks would collapse and a lot of bloodshed could be avoided,” said Max Keiser on Dec. 9, 2018. Hyperbitcoinization should be accompanied by a rapid improvement in productivity and wealth — Hyperbitcoinization will probably be a confusing time for everyone, like a second adolescence. However, once it is over, no one will be able to imagine how we got by with the earlier system. Banknotes stamped by the yellow vest movement. The yellow vest movement is similar to the Occupy Wall Street movement that took place seven years ago and the birth of Bitcoin four years prior. Global citizens are upset with their leaders and losing confidence in the central bank’s paper bills which are printed by the trillions every year. People from all countries and continents are upset with the system and believe something has got to give. Our correspondent from France told news.Bitcoin.com that most individuals don’t wear yellow vests these days because if you take the train “to go to Paris and they check if you have a yellow vest then they can arrest you.” Not only are the protestors in France threatening to burn large stacks of bills, but they are also now printing special images of yellow vests on banknotes. What do you think about the yellow vest movement threatening to burn pallets of banknotes? Let us know what you think about this subject in the comments section below. Images via Pixabay, Shutterstock, and our correspondent from France. The post Yellow Vest Movement Starts a New Form of Protest – Burning Banknotes appeared first on Bitcoin News. Next articleOp Ed: Should You File a Foreign Bank Account Report for Bitcoin Holdings? Are Crypto CFDs worth to trade?